Traveling with your dog requires careful planning, including remembering all of the essentials you need to pack for them. 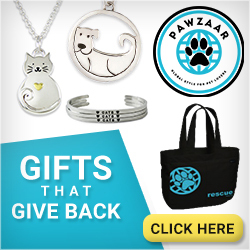 Food, treats, water, bowls, medications, poop bags, toys, blankets, first aid items... The list is endless, and it's almost inevitable that you will forget something. I find that if I have a dedicated bag for all of my dog's essentials, getting ready to travel becomes far less stressful. Organization is key and when everything has it's place, life is good. Disclosure: Solvit Products sent a HomeAway Travel Organizer Kit to Lapdog Creations, free of charge, for review purposes. Lapdog Creations only shares information we feel is relevant to our readers. and all opinions expressed are my own. Solvit Products is responsible for the giveaway prize. This post contains affiliate links. 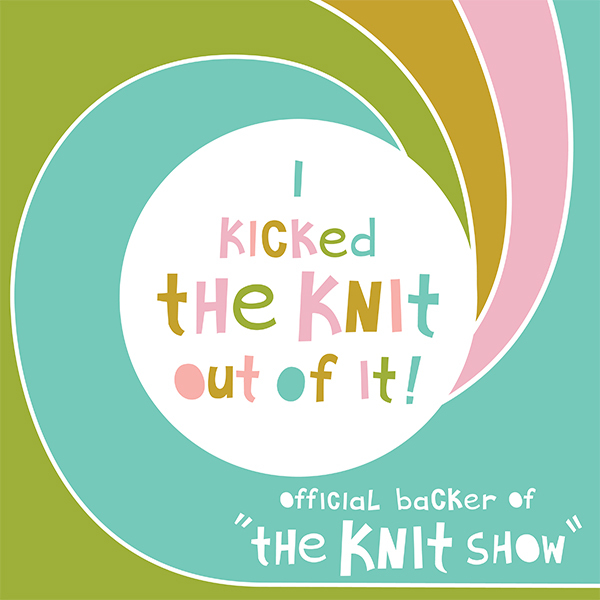 If you click on one and make a purchase, I may receive a few pennies to assist in maintaining this blog. 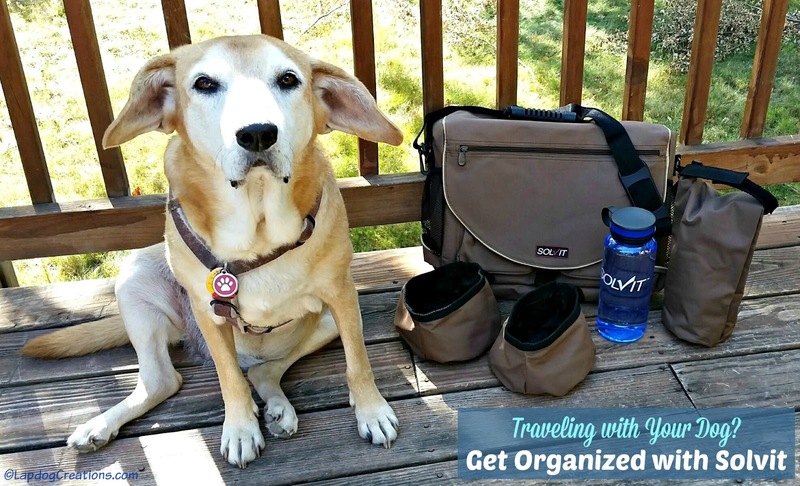 The Solvit HomeAway Pet Travel Organizer Kit makes getting organized a breeze! 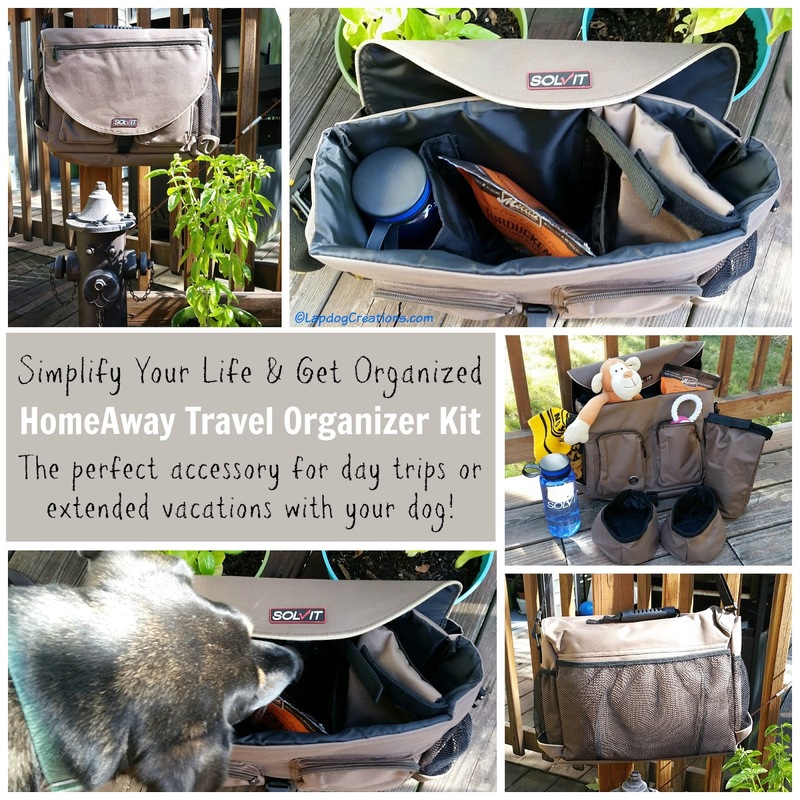 Whether you're packing for a day trip, a weekend getaway, an extended vacation, or just dropping your pup off with a friend for the day, the HomeAway Travel Organizer Kit will help you simplify your live and to-do list! The kit includes a messenger-style bag, water bottle, food bag, and two travel bowls. The organizer bag is a neutral brown color, making it suitable for any pet parent, male or female, to happily carry. Plus, it hides dirt well! The bag has both a comfort-grip, rubberized handle and an adjustable shoulder strap, allowing you to easily carry it like a briefcase, on your shoulder, or cross-body style. On the outside, you'll find three ventilated pockets - one on each side, plus a large one across the back. These mesh pockets are so simple, yet so wonderful at the same time. After all, we all know there will be wet, slobbery, or muddy stuff to take home, and now we have a place to store those towels and toys away from everything else. The front flap includes a zippered pocket, perfect for holding paperwork, books, or anything you need to grab quickly. Additionally, there are two more zippered pockets under the flap, one of which is a built-in poop bag dispenser. The inside features a configurable divider, allowing you to customize the size of the slots to hold the water bottle, toys, treats, food, etc. This is another genius option, as it truly allows you to customize the slots to your needs. 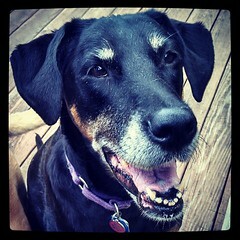 Solvit truly put a lot of research into the needs of on-the-go pet parents! Put they didn't stop at just creating the bag to organize all of our stuff, they included some handy travel accessories as well. The water bottle is unbreakable, made from crystal polycarbonate and BPA-free. It holds a full day's supply of water and features a wide mouth for easy pouring and cleaning. The food bag is fully lined to ensure your dog's food stays fresh, as well as to make for easy cleaning. It holds enough kibble for about 5 days for a medium size dog, however you can purchase an optional extra bags if you have multiple dogs or are going on extended trips. There are two waterproof travel bowls included, and each holds 8 cups. When folded, you can even store them in the two ventilated side pockets. 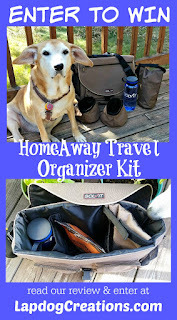 While the Lapdogs don't necessarily care what I tote their food, treats and toys around in, this dog Mom does - and I give the HomeAway Travel Organizer Kit two thumbs up! It's convenient, it's practical, it's stylish, and it helps keeps this busy Dog Mom organized! It's also built to last. Whether we're at the race track for the day or out for a hike, the bags and products I use must hold up to being tossed around, dropped, or even stepped on. The travel organizer is the high-quality, built-to-last item I need for our lifestyle. In addition to travel, the HomeAway Travel Organizer Kit also makes a great emergency evacuation kit. Just be sure to regularly check the expiration for any food, treats or medications you store in it. Does this sound like something you must own? What if I told you Solvit is going to give one lucky winner a HomeAway Travel Organizer Kit of their very own? 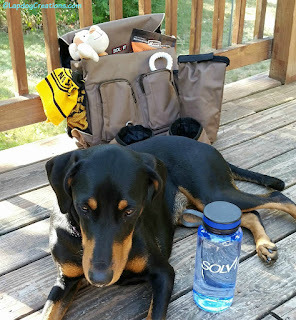 Thanks to Solvit Products, one (1) lucky winner will receive a HomeAway Travel Organizer Kit (note the toys and treats you see in some of our photos are not included)! I have an Aussie mix puppy that I show in Obedience and I'm really hoping we can go to AKC National Obedience Championship and if we ever make it to that level this bag would just be awesome to have! 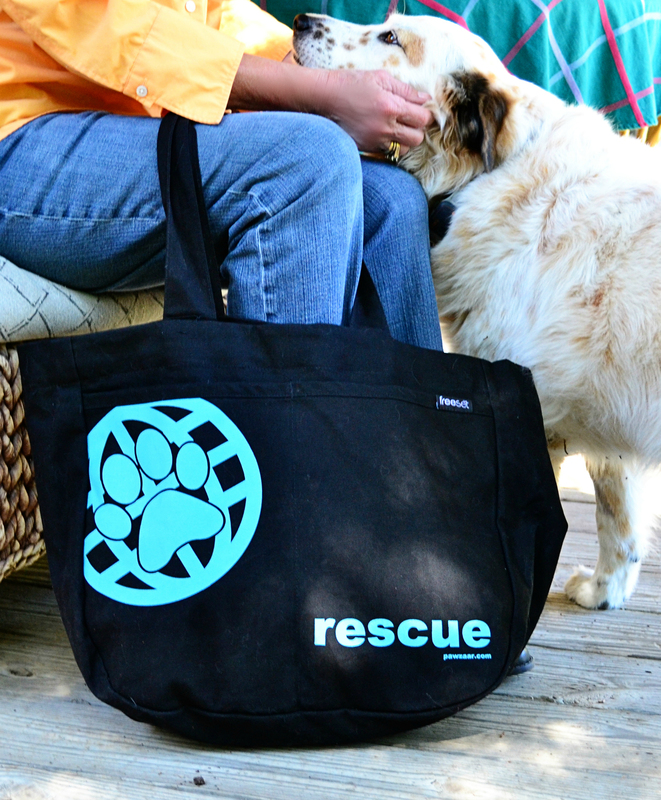 I love bags and totes to organize "schtuff" and this looks perfect for the dog on the go. I have this bag and like it. I use it for training classes, it's usually packed full of stuff! This is so cool! Gremlin goes everywhere with us and usually just shares a bag with one of us. This would make it easier to pack everything he needs and easier to access it when we're on the road! Oh wow, I love this kit! Honestly, we don't travel with our dog, but I really like your idea of using it as an emergency kit. What a great idea! We'd put it to good use in a couple ways. First, it would be great for trips t the lake since we can put all the necessities for a day on the water in one place. Second, it would be perfect for classes and shows. There are things we absolutely need with us, but we don't want to be loaded like a pack mule for a show when we need our hands available. This would solve that problem. That is so cool! It is the perfect emergency kit. We love Solvit and their products! I hadn't heard of this item before and I think it would be great to use considering how frequently we travel with the dogs. Thanks for sharing. That looks like an great active pet bag. Oh gosh we need one of these. Our pups go with us everywhere! Great post with great info! Looks like they thought of everything. Being a cat, I wasn't going to enter but when you mentioned it would make a great evacuation kit, you sold us. We don't currently have one of those. I'll bet that bag gets heavy though. TW can also use it when I go to the stabby place to put stool samples and all the toys and stuff she brings for the adoptable cats they house. We love to travel, love bags and love Solvit! That looks like a really good bag! I must check it out. This is a great travel bag and I'd love to win it along with everyone else!!! I don't travel nearly as much as I'd like to with my pets. We would use it when we take the dogs for hikes, looks perfect!! 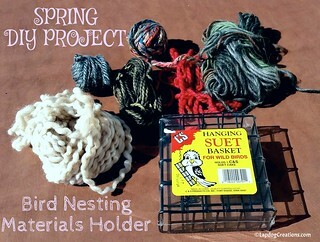 This looks like a well designed and thoughtfully organized bag! I would use it when we take my dogs on vacation. Ruby has this exact bag and it's absolutely fabulous! Wish I had something similar for myself. what a great bag! perfect everything the pooch needs! What a great looking and handy bag! With four Siberian Huskies, it would be very handy to have all of their things organized in one bag for walks or rides. Great giveaway! Thanks for hosting it! What a great idea! 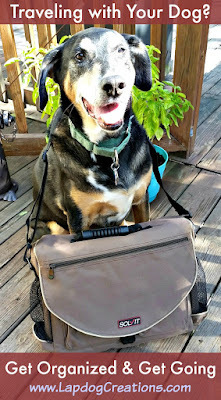 I have never heard of such a dog gear bag. My mom travels with her dog all the time. If we won, we'd give it to Bandit. They are moving away from us in a few months so they'll need a travel kit. Oh I'm so excited! 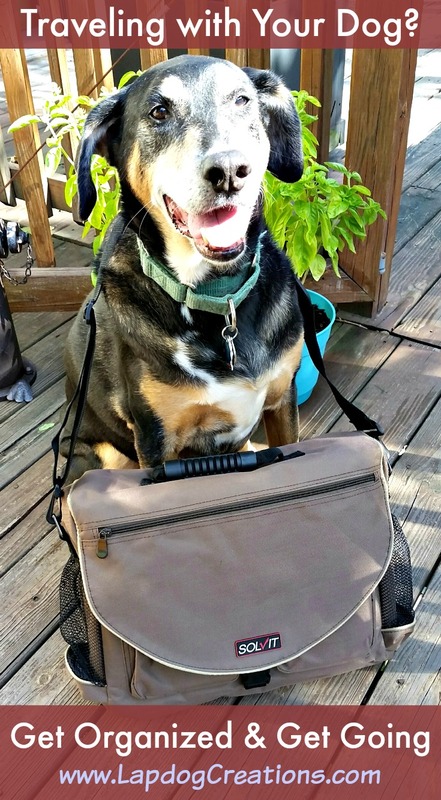 We're going on a coast vacation with the dogs in two weeks and I was just at REI looking for something like this to keep all the dog stuff organized, medication, and gear - I will order one of these. Do you have an affiliate code? For hikes and traveling. It would keep me nice and organized! This looks like a fab product and i love the way you have used it as an emergency first aid kit way to go!! Looks like you're a super organised pup - that bag looks awesome! It would be nice to have this organizational bag and accessories. 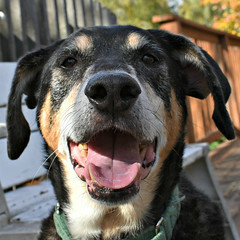 Bowser goes everywhere with us from day hikes to weekend camping trips to short road trips. whenever i go to the vet, or to the dental specialist 190 miles away, and to dog events, i always carry a bag with water, treats, brushes, pick up bags, extra leashes, towels and wipes and then add my stuff in it. so this would be great to have. i also usually put some small toys in it as well. dont know if my 1st comment posted, this would be great since i carry a bag with me to the vet, dog events, and to the dental vet 190 miles away. i carry water, treats, toys, brushes, wipes, doggy doo bags, towels, extra leashes, some of my things so i dont have to carry a purse. I am drooling over this beautiful bag with all those wonderful compartments - I love that & I always need them! I'm so entering this contest, we travel so extensively and this would be ideal! I would use it to keep extra changes of clothes and other need items for my kids in the car. This would be so helpful when travelling with my 3 dogs back & forth to TN. What a great looking bag! When going to events or travelling with Edie I feel like I'm packing for an entire family with all her items! I'm always on the look out for a product that can help make my travels easier. We like to take Mollie to visit family out of state, it would be great to be able to get all of her items together in a nice bag instead of a plastic shopping bag! A bag just for dog stuff? Now that is a brilliant idea. Love it! I would use this when we go camping and hiking overnight. We also travel to Colorado in the summer so this would come in handy. This would be great when going out of town or camping. I would give to daughter to use when she takes her dog camping. Oh my goodness! We need this! We take our dogs on so many road trips but we are always packing their stuff here and there. This would allow us to pack all of their stuff nice, neat and easy to get to. I would try to get myself and my dogs organized by having their travel items all ready to go, instead of scrambling at the last minute. I'd use these as emergency or road trip bags - with 3 dogs we totally need this! This would be great for when we day trip with our shelties for their snacks, water bowl etc and even for weekend trips with more things taken for them. 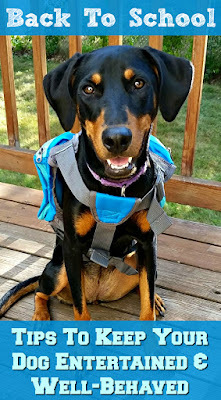 We take our dogs on lots of hikes and road trips with us so this would be awesome for traveling! I would use it for when we are out with the dogs. We go hiking, to the lake and traveling so it would be so helpful for organizing all the dogs things. What a pawfect (!!) idea! Like a diaper bag for pups! This would be awesome to have! What a pawfect (!!) idea! Like a diaper bag for pups! I take our puppy almost everywhere with me and this would be a great bag to have. 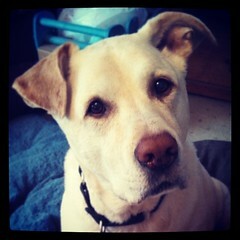 I always have tons of bags, doggie food bag, treat bag, toy bag, water bowl. It would be great to have everything in one place!